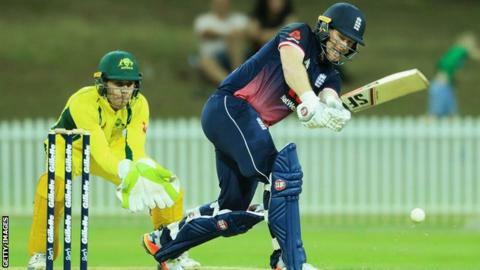 Eoin Morgan's unbeaten 81 helped England to a five-wicket win over a Cricket Australia XI in their limited-overs warm up match in Sydney. Leg-spinner Adil Rashid took 3-45 as the hosts, captained by former Test opener Matt Renshaw, posted 258-9. Openers Jonny Bairstow (36) and Jason Roy (40) began the chase in steady fashion before Morgan and Alex Hales (52) helped England home. England's five match ODI series against Australia begins on Sunday. Test captain Joe Root carried the drinks after a viral illness left him unable to bat after lunch on the final day of the fifth Ashes Test. Australian umpire Claire Polosak became the first female to officiate in an England match as she oversaw play at the Drummoyne Oval. Travis Dean top-scored for the Cricket Australia XI with 75, while 17-year-old Mackenzie Harvey impressed with 59 from 48 deliveries. Pace bowler Liam Plunkett finished with 2-52 but Mark Wood, who was recalled to the Test squad for the tour of New Zealand on Wednesday, registered figures of 0-68 from his 10 overs. Hales, making his first England appearance since being interviewed under caution by police over an incident outside a nightclub in Bristol in September, hit four fours and three sixes in his 35-ball innings. Moeen Ali impressed with the ball but again struggled with the bat, making just one before he was dismissed by seamer Gabe Bell. Australia have added batsman Cameron White to their one-day squad after Chris Lynn was ruled out with a calf injury. White has not represented Australia in 50-over cricket since 2015, and gave an interview in December saying he thought his international career was over. "He's experienced, he's a very smart cricketer and he's a good fielder. He ticks all the boxes for what we need at this stage," selection chairman Trevor Hohns said. Podcast: Do England care enough about winning abroad? Read more on Podcast: Do England care enough about winning abroad?